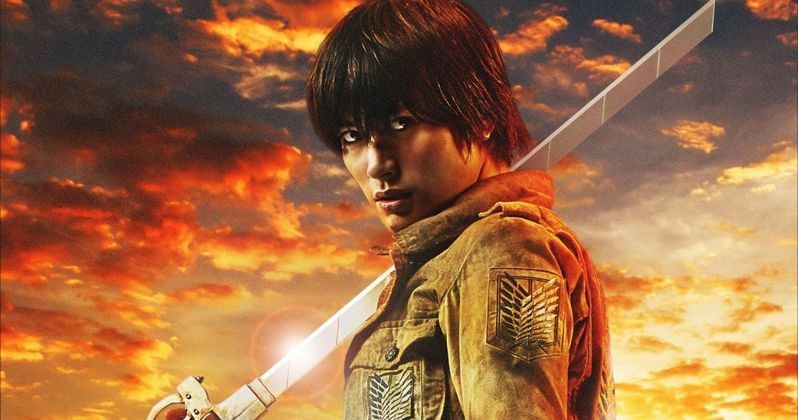 While it isn't exactly known when the Japanese manga adaptation Attack on Titan will hit theaters, six new character posters have debuted, giving fans a proper introduction to the main cast. Shinji Higuchi (The Last Princess) directs this live-action adaptation, based on Hajime Isayama's 2009 manga, which is set in a world where humanity hides behind massive walled cities, to protect themselves against monstrous humanoid creatures known as the Titans. The story centers on Eren Yeager (Haruma Miura), his adoptive sister Misaka Ackerman (Kiko Mizuhara) and their friend Armin Arlert (Kanata Hongô), who all join the elite fighting unit known as the Survey Corps to battle the Titans, after Eren's mother passes away following a Titan breaching the walls. Check out the one-sheets featuring Eren Yeager, Misaka Ackerman, Sasha Blouse (Nanami Sakuraba), Jean Kirstien (Takahiro Miura), Hange Zo (Satomi Ishihara) and Armin Arlert. The adaptation is scheduled to arrive in Japanese theaters next summer, but it isn't clear when it may debut stateside. Stay tuned for more details about the U.S. debut of Attack on Titan as they come in.